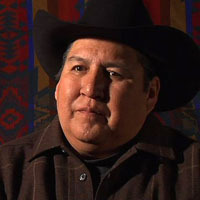 Hubert Two Leggins is the Crow Histories Project Coordinator at the Little Bighorn College in Crow Agency, Montana. A fluent speaker, he tells of his work at the College as well as the Crow perspective on the 1851 Fort Laramie Treaty negotiations. Crow History Through Oral Tradition - Hubert Two Leggins. 1851 Fort Laramie Treaty and the Crow - Hubert Two Leggins.